So Hollywood producer Harvey Weinstein is in the news lately. There are dozens of credible stories and witnesses of him harassing, molesting, blackmailing and sexually abusing various actresses. At least one actress–Rose McGowan–received a cash settlement after Weinstein raped her. In fact, she used her voice and used Twitter to tell others what happened to her. In return, Twitter temporarily disabled her account. Society doesn’t like an abuse victim who tells others what happened. When Bill Cosby was similarly accused, the victims were trashed and smeared. Repeatedly, I read posts about how they were liars, gold diggers, and worse. In this Weinstein situation, people are taking the women seriously. Maybe because some of the actresses with stories about his behavior are more famous? Because they are famous, they get more credibility? Life shouldn’t work like that, but unfortunately, it does. We little people don’t matter as much. These rich and famous predators get away with their behavior because they have power. The rich and famous victims are sadly, more likely to be heard and believed than the less famous women. If Angelina Jolie and Gwyneth Paltrow say he’s a pervert, people listen. If a less famous woman says the same, people accuse her of looking for money. If an every day person like one of us speaks up about abuse, we are almost always ignored, and worse, bullied for it. For years, Weinstein has been a predator…and everyone knew it. Dozens of actresses report that they felt like they would lose their careers if they didn’t comply with his creepy wishes, or if they dared talk about it. So they didn’t talk publicly about it. They just let it go on because there are advantages to keeping the rich producer happy–you get to star in more of his movies and get rich yourself! His predatory nature was an open secret. It was accepted as part of the job. It was enabled by people who didn’t care if he was stopped as long as they were safe. These actresses who never spoke out were protecting their own careers, which protected Weinstein. Mc Gowan opened her mouth…and got a Twitter ban. Several actresses said that avoiding Weinstein hurt their careers. But most of them? They admit they knew something was wrong, but just let it go so they could keep working. Ashley Judd stated “How do I get out of the room as fast as possible without alienating Harvey Weinstein?” She knew he was a sicko…but didn’t want to alienate him. How sad. Would most people be willing to alienate a sociopath and lose their social standing in order to speak out against predators? I understand the reasons women are afraid to speak. I understand the reasons Cosby’s victims were afraid to tell. The minute they did, they were destroyed in the media. When Bill Clinton’s mistresses talked, they were destroyed by the media. Monica Lewinsky’s life was basically destroyed while he turned out okay in the long run. The man was okay…the woman was destroyed by multiple people–including his wife. Although I have left the majority of my social groups that include my sociopath ex or people who know him, I still remain in a couple Facebook groups that have mutual acquaintances. In one of the groups, this Weinstein topic came up and people, (who also know my ex,) were questioning how dare these women KNOW that Weinstein was a pervert yet never say anything. In fact, many actresses and politicians praised him as a visionary and a talented, great man…despite this unspoken secret that so many women knew. I read the thread thinking “hello, this was my life and so many of you did the same thing.” So many of our common social acquaintances know my ex is a violent predator. Even his worst enablers–his flying monkeys who terrorized me–admit that he’s a jerk. And yet, they were totally devoted to protecting him and attacking me for talking about what we ALL knew to be true! The reality is, on all levels of society, there are sociopathic predators out there. Many of them are charming and fool people, but not everyone is fooled. There are people who know the truth and choose to hide it, defend it, enable it, protect it, and encourage it. They are more than happy to shield a predator as long as it does them some good. 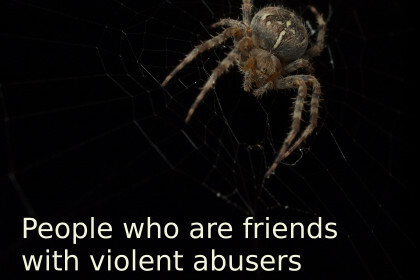 It keeps the sociopath off their backs. It helps them remain popular. It helps them get better jobs and make more money. In our every day situations, our sociopaths do charm and fool people, but they don’t fool everyone. And sadly, sickly, not everyone who knows the truth even cares. Some people are apathetic and don’t care if another person is a predator. Some don’t want to rock the boat. Some think it’s cool or funny. I personally, will always open my mouth wide when I see a predator. I will never be rich, famous or even popular. That is fine with me. 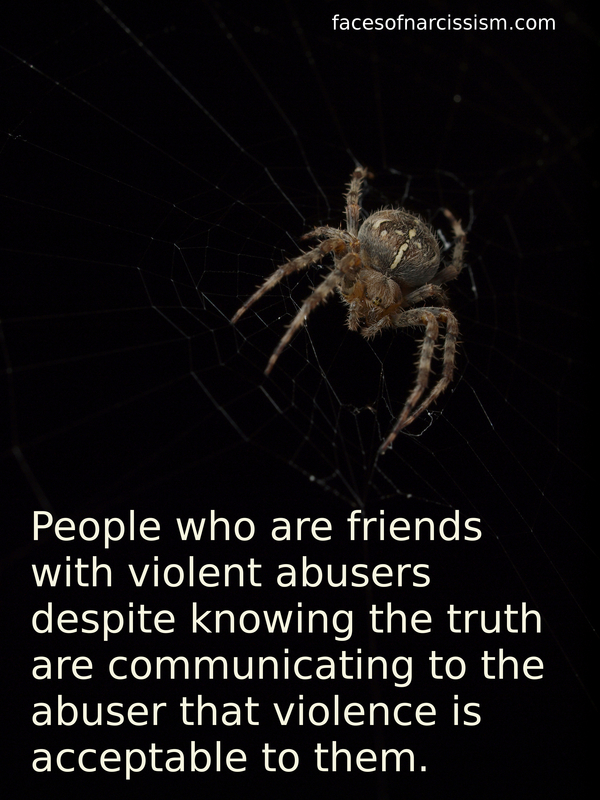 What is more important is doing and saying the right thing…and the right thing is to say “no” to abusive and predatory behavior even if I am alone. At least I know my conscience is clear. I’m being stalked by a crazy woman…and it’s my mother! While i agree with most of this post, McGowan is precisely the type of person we can’t rely on. She is almost certainly cluster B and that makes me very hesitant to believe anything she says. I don’t know much of anything about her. However, if all these other women have similar stories, it seems like hers must be true as well. Also, remember, people with BPD are common targets for sociopaths. Unfortunately, the insecurities and poor decisions of someone with BPD match well with the dominance and pushiness of a narc.